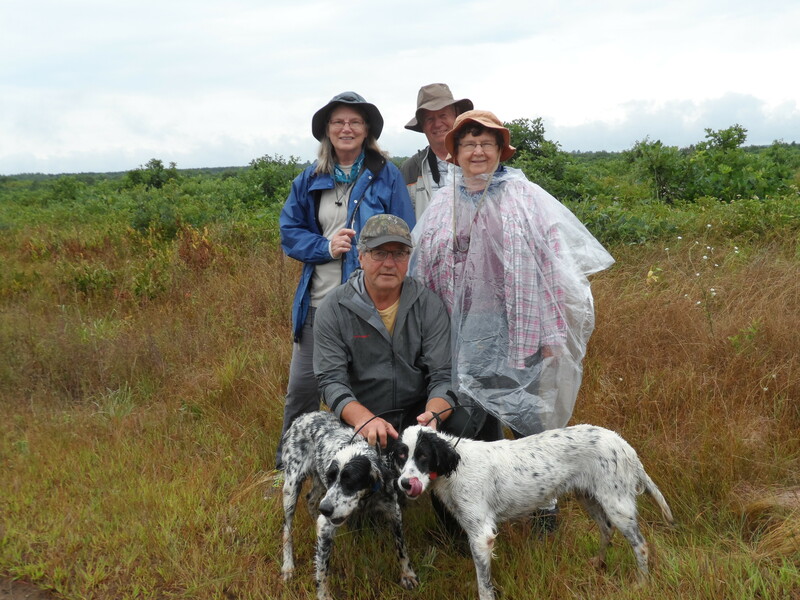 Friends members Jerry McAllister and Mark Nupen led a nature walk along with two English setter bird dogs, Daisy age 12 and her daughter Floss age 8. August 1 is the first day that dog training is allowed on DNR property. The Namekagon Barrens is the last, best refuge for sharp-tailed grouse in Wisconsin. The young of the year are ready to fly by this date. Joining us were two first time visitors from Spooner and one from Siren. They heard about the nature walk from Facebook and the local newspaper, respectively. It rained on and off all morning making scenting conditions very difficult We walked for a mile just west of the clubhouse, a mile just to the west of No Man’s Lake, and made a big circle around the south lek just north of the Forest Home School site. The dogs flushed (no points) 3 singles and 1 double. All five birds appeared to be adults. Good results for all. Disappointing not to see a covey or two with juveniles. We did get wet. Points were made on a covey of wild turkey juveniles, followed by a flush of the adult hen. A turkey egg was observed.